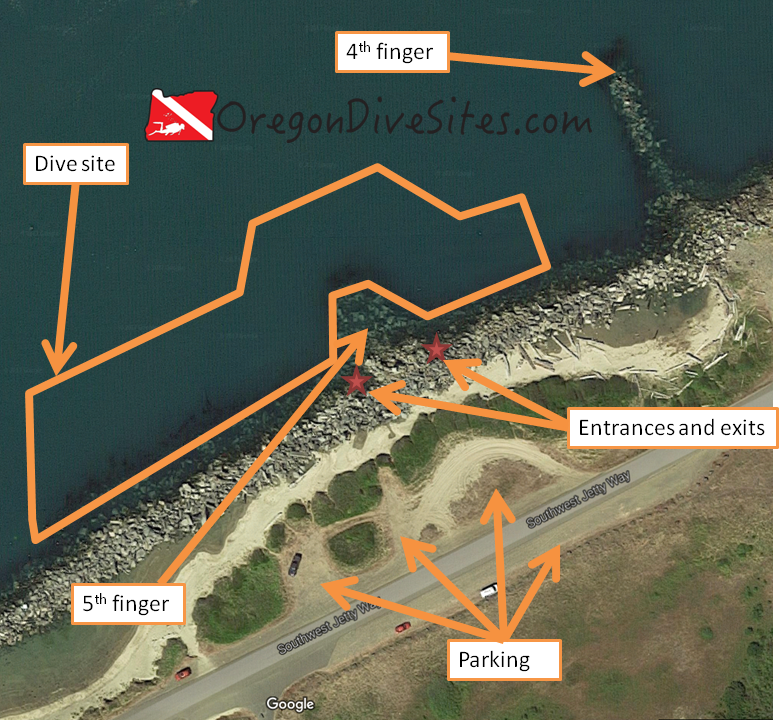 The fifth finger of the south jetty at Newport is a great saltwater Oregon dive site for people who want a more challenging dive. SCUBA divers are rewarded with excellent micro life all over the jetty rocks and often are treated to seeing perch, lingcod, and crabs. Once we had a seal playfully nip at our fins here. This dive site is physically demanding due to the entrance and divers must dive this site at slack tide (we prefer high tide for better visibility) unless they are willing to put up with a fierce current at the end of the finger. Looking out to sea and at the north jetty from the fifth finger on a stormy day. We chose not to dive the fifth finger this day because the surge and surf were more than we wanted to deal with at the entrance. For us, the highlight of this site is the abundant life both big and small. We have found several species of nudibranchs, many different species of crabs including the species that you can harvest and eat for dinner, lots of different types of muscles and barnacles, many perch, rockfish, and lingcod. People will often spear fish this dive site and will also hunt for crabs here. We have had good luck catching red rock crabs when SCUBA diving here. Some of our SCUBA friends like this site for the challenge of the surf and surge, and the ease of hopping between dive sites to the other four fingers along the south jetty at Newport. If you have gone diving at this site many times, we highly recommend doing a night dive here. The site is completely different under a full moon at high tide than what you experience during the day. Newport, Oregon is just a few hundred feet down the jetty. Head to Newport and follow signs for the aquarium. Take Southwest Jetty Way toward the ocean. It can be a bit difficult if this is your first time diving on the fifth finger to figure out which of the fingers you are at. The GPS coordinates (above) can help with making sure you’re at the right dive site. There are pull-outs to the north of the road. Be sure not to block other SCUBA divers or anglers in when you park. If you don’t mind the walk, parking across the south side of the road is also available. Parking here was free the last time we went diving at fifth finger. Imagery ©2017 Google, Map data ©2017 Google. The entrance and exit at this site is challenging but all of the underwater life is worth the effort. The jetty runs west-southwest out to sea. If you get lost, head south and you’ll find the jetty again. If you head north, you might make it to the other jetty before your tank runs out of air but there is a good chance the current will take you up into Yaquina Bay or out into the ocean. The fifth finger is a pile of jetty rocks that many SCUBA divers enjoy. It only takes a few kicks to go from the jetty out to the tip of the fifth finger but there is a lot of life to see packed into the small area. The site extends to the west along the main jetty. We have gone along the jetty about 750 feet toward the ocean before and have found more great life but the conditions get dicey out there when the tide swings. If you get stuck beyond the protective cover of the fifth finger, you can climb over the jetty at any point to reach dry land again. To the east of the fifth finger is the fourth finger. Some people like to dive the fifth and fourth fingers together. We have done this before but we prefer diving each as a separate site so that we can take our time and enjoy looking for tiny nudibranchs smaller than a pencil eraser and scouting out the hiding holes of lingcod and crabs. We won’t sugar coat the entrances and exits at the fifth finger. They are difficult and require good physical stamina, strength, flexibility, and balance. We have seen a few SCUBA divers fall navigating the jetty rocks trying to get into or out of the water. Go slow and pick your route carefully. We scout the route that we plan to take before we gear up to make sure there aren’t any surprises. The two best places to enter and exit are on either side of the fifth finger where it meets the jetty. You can make your entrance or exit anywhere along the jetty although other areas are more difficult. This is a saltwater dive although freshwater from the Yaquina River pumps out through the estuary upstream and heads out to the ocean. Unless you’re diving at low tide, you will have 100% saltwater. We have seen all sorts of conditions at the fifth finger from completely calm and placid days that make you think you’re diving in a swimming pool to days where the breakers are crashing over the north jetty and pounding the south jetty, too. Pay close attention to the surf forecast and the weather report. This is the most exposed of the five fingers. The only more exposed you can be is if you dive the tip of the south jetty or go offshore with a boat. When the fifth finger is good to dive, you may encounter surf, surge, and strong currents. Anglers and crabbers use the fifth finger as well. Be mindful of their lines and pots. We once got tangled in a fisherman’s line when he hooked one of our fins. Sometimes fishermen intentionally cast their hooks on top of SCUBA diver bubbles either not realizing or not caring that divers are below. It’s a good idea to have a dive flag in the water with you. We have one that we like and use listed on our Gear We Use page. 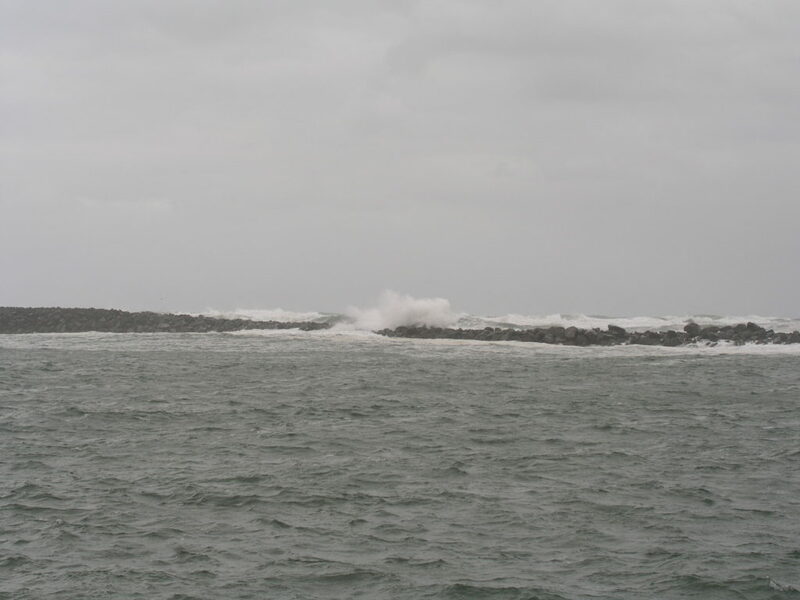 A big wave breaks over the north jetty. 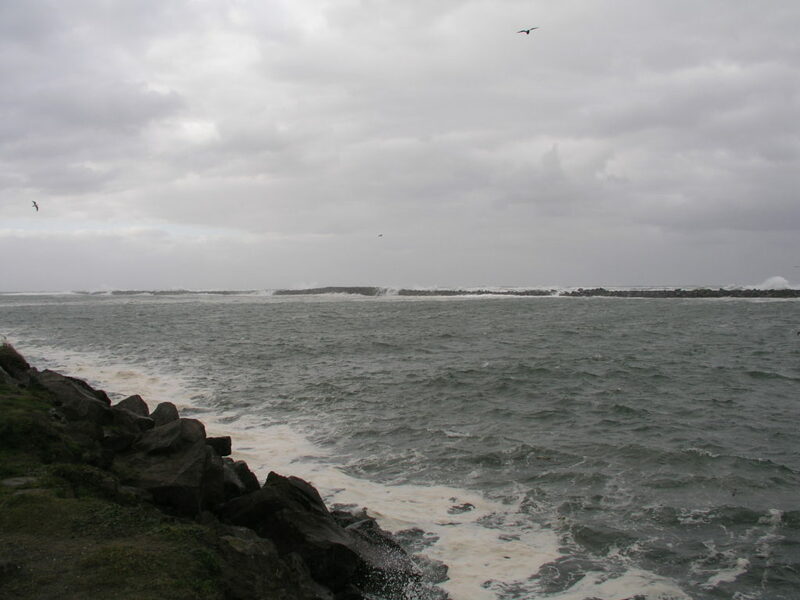 On really rough days, the waves can roll right over the north jetty and make diving the fifth finger on the south jetty all but impossible. There are plenty of other dive sites in and around Newport to dive when the fifth finger is not viable. Visibility is usually 10-15 feet at high tide. At low tide, visibility can be as low as 3 feet depending on how much silt and sediment the Yaquina River is pumping out. Recent rains and upstream logging activity can make visibility worse. The bottom is sand and settles very quickly. We have seen water temperatures here between 42F and 50F depending on the time of year and ocean conditions. This site is fine to dive all year long although winter storms make it more challenging to find a day with good conditions. We have hit 40 feet at this dive site at high tide although most people will stay in the 30-35 foot range. We know freshly certified open water divers who have successfully gone diving at this site. However, you need to be confident in your skills, be physically fit, and dive with the conditions. The dive itself is not that difficult but the entrance and exit are hard, and the current, surf, and surge can be a challenge. We consider this to be an intermediate dive although our SCUBA friends rate this from easy to difficult. Depending on where you park, you might have to walk 200 feet. Usually you will only need to do a 100 foot walk although the last part is over the jetty rocks. We highly recommend diving this site at high tide. We usually can get two dives in at this site back to back by diving on either shoulder of high tide. It is a good idea to have a dive flag at this site if there are any fishermen around. We have our trusty workhorse SCUBA flag listed on the Gear We Use page. A dive light is also handy to look into all the hiding places on the fifth finger. Remember to pay attention to the weather and marine forecasts. Only dive this site if you are comfortable and know what you are doing. There is a dive shop in Newport that does air fills and has a selection of SCUBA gear. Newport has a whole host of great restaurants on both sides of the bay. Let us know if you have suggestions on where to eat. South Beach State Park Campground is a good place to camp if you’re diving in Newport. We haven’t tried any of the hotels or private campgrounds in the area. Let us know if you have suggestions on where to stay.